In this investigation, we argue for why and how available intraclass correlation coefficients and other types of reliability estimates can be employed as sample-based reliability estimates within primary and meta-analytic studies when relationships between group-level phenomena are of interest. 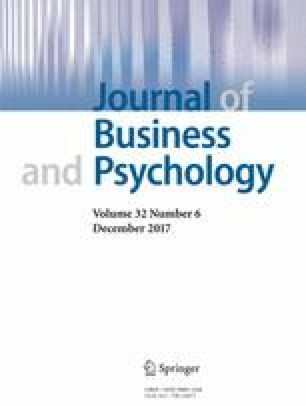 Group-level correlations and reliability estimates were obtained from 46 studies examining organizational climate–performance relationships. We illustrate how the group-level reliability estimates can be used to correct correlations for predictor and criterion unreliability. Procedures are presented for computing the sampling variances of individually corrected correlations that account for sampling error in the group-level reliability estimates. Support was found for the conservative nature of meta-analytic parameter estimates when group-level reliability information is sample-based as opposed to assumed population values. In addition, our analyses indicated that conclusions about substantive relationships between group-level variables can change based on availability of sample-based reliabilities within both primary and meta-analytic studies. Results from this study suggest that researchers should rely on sample-based meta-analytic procedures when examining the generalizability of group-level relationships. This study also demonstrates the importance of using all available reliability information and accounting for sampling error in the reliability estimates when conducting meta-analyses at the group level of analysis. This study breaks ground by systematically examining the use of intraclass correlation coefficients as reliability estimates within group-level meta-analytic studies. Furthermore, illustrative analyses provide guidance to primary and meta-analytic researchers in regard to how to correct group-level correlations for unreliability in the predictor, criterion, or both whenever and in whatever proportions the artifact information is available. The RBNL meta-analytic program is available upon request from the third author at mburke1@tulane.edu.